While I am happy vacationing in Spain the first 2 weeks of July I thought it would be fun to post a couple of reviews of animation art books I own. If you don’t have an art book it’s pretty self explanatory. 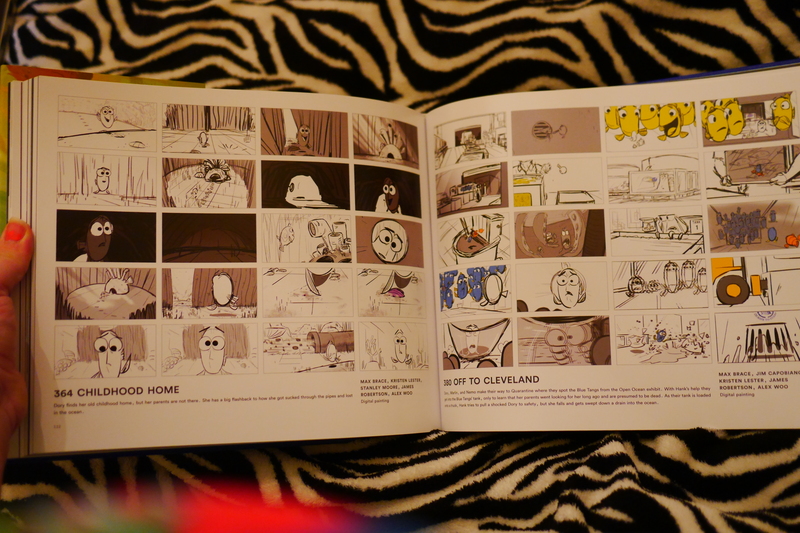 It’s a book that explains and shows the art behind a particular film. These are not limited to animation (Marvel, DC and Star Wars for example have them) but all that I own are. I might not be quite as quick to respond to comments as I usually am on these art book posts because I will be gone. Have patience with me and I hope you enjoy them! The first book we are going to look at is from the most recent animated release, Finding Dory. It is the Art of Finding Dory. It’s kind of interesting because this art book has a preface, introduction and forward. 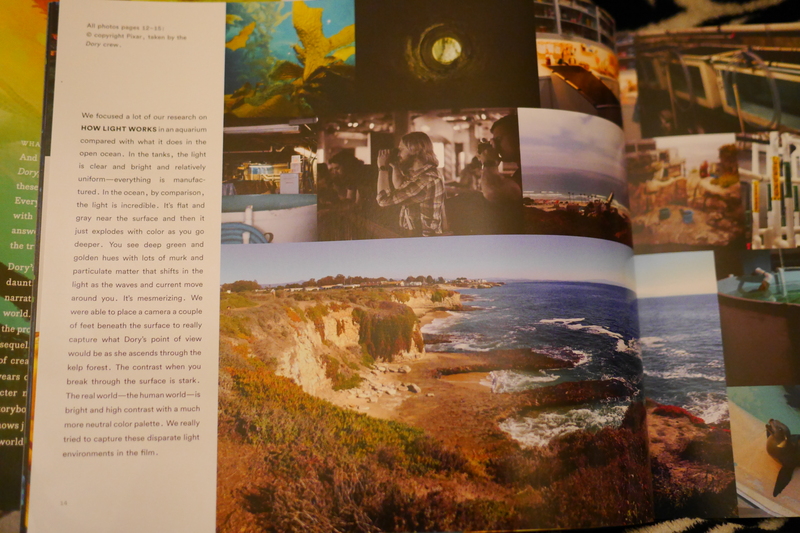 The preface is by John Lasseter and he talks about the first time Andrew Stanton pitched Finding Nemo (“You had me at the word fish”) and then Finding Dory (“Nemo had as its canvas the entire ocean, but Dory expands that world even more…where even the plainest quarantine tank is lit by intricate caustics of light playing along its walls and floors). 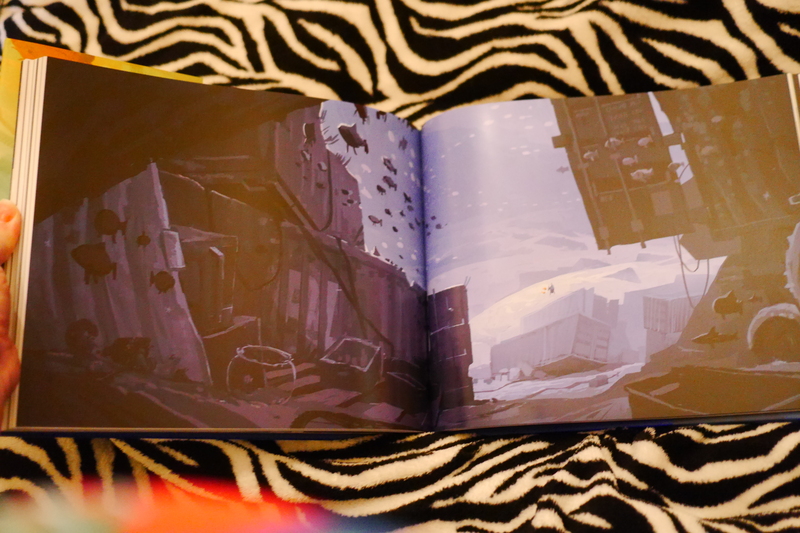 That emphasis on light and how it was used by the artists is a big theme of this art book. The forward by director Andrew Stanton is quite moving. It shows the emotional connection he had to Dory from get-go. He says “Dory was lost. Most people overlook that fact…You see, Dory was looking for her family, too, only she had forgotten that fact. Dory had been lost for years, no knowing where or when that tragic separation occurred. I’ve always wanted to believe every audience member sensed that longing in her- that a fish with short-term memory loss, wandering the ocean alone, couldn’t truly be happy”. I know feel thoroughly guilty for never thinking that much about Dory- the poor fish! I’m so glad Andrew Stanton told her story because clearly he was very moved by it and it shows in the finished film. Finally, the introduction by author Steve Pilcher, pencil and marker man on Finding Dory, shares his perspective on the design of Finding Dory. “The way shapes, color and light worked together to support the intent and focus of a shot became a carefully coordinated balance from sequence to sequence, shot to shot”. You can tell The Art of Finding Dory is written by a technician like Pilcher because it is very technical but I found that fascinating. 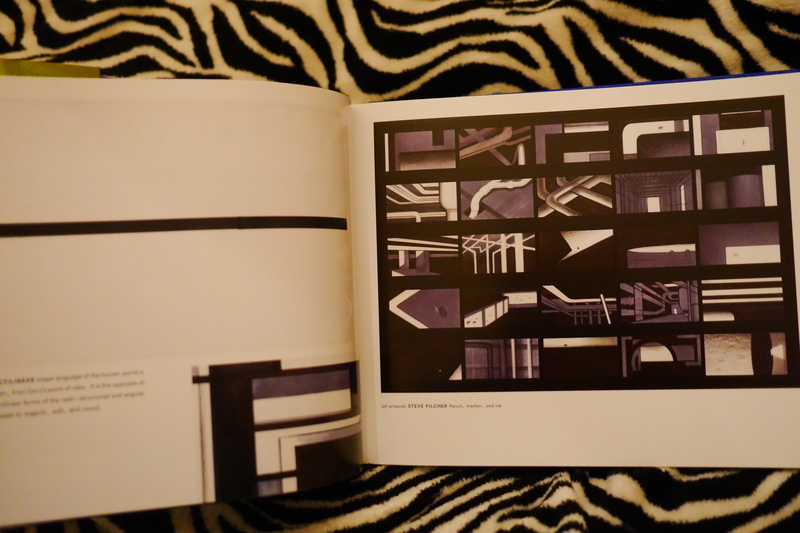 The first part of the book is all about the production design. They focused a lot on lighting and how the ocean illuminates things differently than on the land/tank sequences. 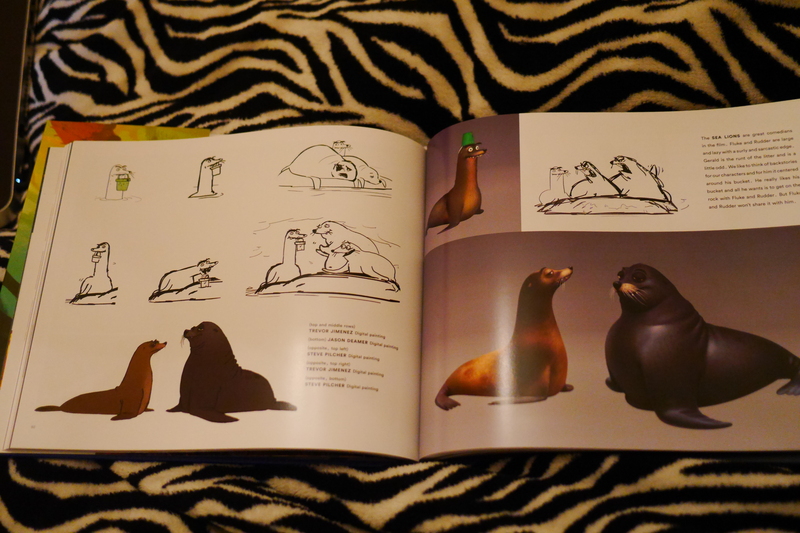 I really liked pages that showed the sketching process to making Finding Dory. They then have tons of information on character design for both small and larger characters. Next we get tons of storyboards showing the evolution of the film’s story. I love looking at storyboards. It reminds me there are men and women actually drawing this stuff! 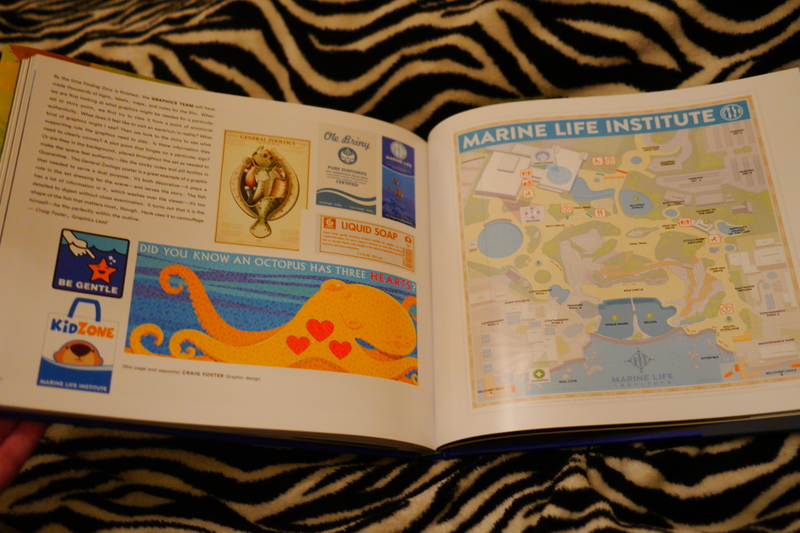 Finally we get to see the layout of the Marine Life Institute and all the small details from the flags, maps and signs. They designed everything for the park- even stuff you don’t really see like the Kidzone bag you see above. That’s so cool! 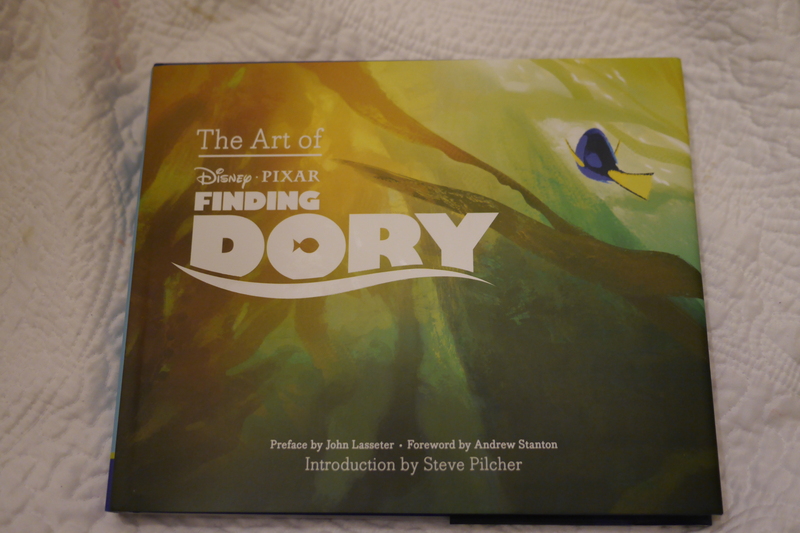 If you liked Finding Dory then I think you will definitely like the Art of Finding Dory. It’s beautiful to look at but very enriching as well. I learned a lot about computer animation and the Pixar brainstorming process. Let me know if you get to check it out what you think. Thanks! Spain! I am so jealous. Have a wonderful and safe time. This is so cool! I wish I was more impressed by the film as a whole though haha! In the odd chance you’d be interested in reading some random movie nerd’s review, feel free to check out my blog, I’d really appreciate it. I’m new to the blogging scene but really want something to come of this because I’m overly passionate about film! Thanks for sharing this super cool review along with the gorgeous artwork behind the scenes. I will totally check out your blog. I did a whole post reviewing the film a well. This book review was just kind of a bonus. Glad to have you on board the movie blogging scene! Awesome! thank you thats so kind of you! I look forward to future posts of yours!